Would you like it shrink wrapped? CD Duplication is suitable for reproduction of smaller quantities from a CD master. CD and DVD Duplication services are normally used where the volume of discs is less than 500 units. An advantage of CD and DVD Duplication is very fast turnaround time, from 24 hours depending on your choice of packaging. CD and DVD Replication set-up costs include the manufacture of glass masters from which the discs are produced, meaning it is not a viable option for shorter runs. Additionally clients choosing CD replication services often require design, production and printing of artwork for disc onbody, using silk screen or offset litho, and for paper parts to complete the presentation of the CD or DVD. At Xpresscds we specialise in providing a package of high quality CD or DVD replication with professional design, printing and packaging solutions. Xpress CDs offer CD and DVD Replication of the highest technical quality at the best possible prices. Replication is ideal for large quantity CD and DVD runs - this can include promotional business tools, brochures, powerpoint presentations and a huge variety of multi media applications. Xpress CDs are always happy to offer help with artwork or content. If you have any specific requirments for CD and DVD replication then please feel free to contact us, we will always try to satisfy individual requests. Our duplication department uses only state of the art 600dpi thermal printers, top quality "A" grade discs and premium packaging. This together with our expertise ensures we produce consistent professional CDs and DVDs which are the highest standard within the industry. We are a leading CD and DVD manufacturer in the UK, our reputation is maintained by our policy of quality products and customer care. We supply CD Duplication to clients in Kent, Essex, Sussex, Surrey, Devon, Cornwall, Norfolk, Suffolk, Yorkshire, Lancashire, Cheshire, Midlands, Cumbria, Durham, Staffordshire, Hereford & Worcester, Wales, Scotland & Ireland. For the last 20 years we have been providing CD duplication and CD replication to a huge variety of clients; from small businesses to global corporations! Our many years of experience in the CD duplication and CD replication sector means we have the knowledge and expertise to provide CD and DVD production of the highest quality and we cannot be beaten on price. For the most competitive duplication quote online, contact us today! In addition to our CD and DVD duplication and replication services, we are also happy to offer a leading CD printing service. A standard auto-run CD-ROM can offer a great way to deliver corporate presentations, promotions and training. With CD replication you have the ability to include video, audio and interactive content such as flash or virtual tours, the possibilities for your CD-ROM are endless. We offer highly competitive prices for CD-ROM replication, making it a very viable alternative to print for distributing your marketing materials. An 8cm or "mini" CD has a maximum capacity of 200mb / 22 minutes and offers an alternative marketing tool for your products. Unlike CD business cards, the mini CD retains the familiar circular format and can be printed full colour litho photo quality or with pantone colours to match your corporate identity. Xpresscds offer various packaging options for mini CD duplication or replication including paper wallets in a range of colours, CD poly wallets with or without adhesive strips or hard CD jewel case, DVD case or bespoke CD packaging such as colour card wallets to suit your own product or corporate image. CD Duplication clients from Manchester, Birmingham, Liverpool, Newcastle, Plymouth, Exeter, Cardiff, Brighton, Bristol, Oxford, Peterborough, Leeds, Edinburgh, Glasgow & Bournemouth use our services regularly. 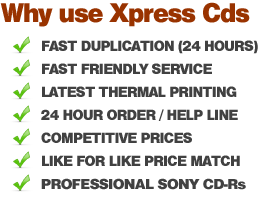 If you are looking for CD pressing, you need look no further than Xpress CDs. At Xpress CDs we try to take a responsible view of the world around us. To offset our carbon footprint we are planting native broadleaf trees. Currently we have over 500 trees growing in our own managed plantation, hopefully this number will reach 1000 by the end of 2010. Together with our clients Xpress CDs want to help reduce carbon emissions and create a better environment for tomorrow.